I ordered two frames for a couple of prints I had. They arrived quickly and were just as I expected. Happy with the quality and ease of the process! 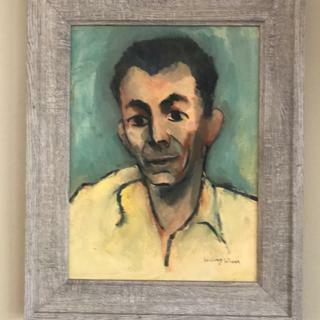 This weathered gray frame now surrounds a 1960's era oil painting of a French coastal fishing scene. 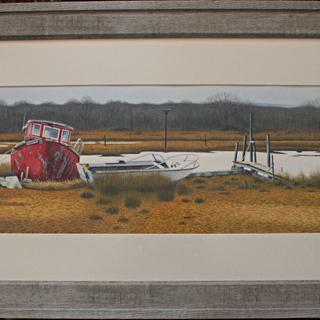 With its driftwood-like color and texture, the frame compliments the blue sky and weathered red fishing dingy lying on the tawny sand. The oil catches the eye immediately upon entering the room. 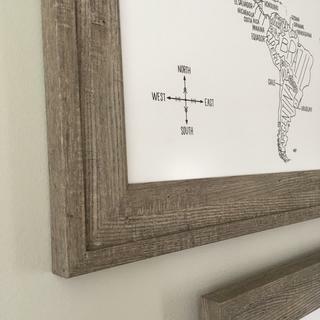 The only issue is that the canvas frame's depth exceeds the depth of the outer frame, so that the clips provided did not work without screwing them into the wood. Please provide clips appropriate to the individual artwork next time! Calvin we appreciate your feedback. We apologize that the hardware provided did not work properly with your painting. We have canvas clips which are designed to fit deeper canvases inside of more shallow frames. We certainly did not want you to have to drill the holes yourself. We will look into emphasizing the importance of the canvas clips. Thank you again for your business. Love it more in person. Love the color and the quality. Looks exactly same as the photo. I used to work in a frame shop so I know frames. This frame is nicely made and was a good price. Service was fast and the website description and pictures were accurate. It came very well packaged too. I'd use this website again for sure. This frame looks so nice with the sunrise at the ocean picture I used it for. The quality and workmanship are top notch. I would recommend this frame to a friend. Used on a tiny painting of a sailboat regatta. Looks like it belongs and its over size puts more focus on the oil. Looks like weathered wood but so easy to pop my print and glass in. Casual style perfect to showcase my blue heron print. Love it! This is a nice frame that goes well with my seascape painting. Well made and will buy again. Enhance the beauty of my paint! Thank you. Top quality, simply beautiful frame!!! This frame is a perfect fit for our picture: an artist rendition of our beautiful home of 30 years. The painting, which is so important to our family, needed a frame that would enhance both the art and the memories within the art. A tall order but we found it, a perfect fit!!! The frame is very high quality, high value. I think it would have cost us twice as much from a retail frame store. Brought to new heights !!! This is a nice frame, sturdy and nice looking. My only surprise is what I thought was wood is actually a paper laminate on pressed wood. Still, I decided I liked the frames. The frame looks great and seems to be good quality. However, when I received the frame in the mail the plexi-glass or foam core backing was not in the package. I contacted customer service and they fixed the error and sent it. Unfortunately, it took a long time. I put the frame together and added my print, and when I went to screw in the D-rings for hanging, there was only one included in the package. Now, I have to go and find a replacement part. I understand that mistakes happen, but two missing pieces is very frustrating. Hello Sheila. Thank you for taking the time to submit a review. We understand that your project was delayed twice and we sincerely apologize for that. We want you to know this issue was addressed and you can expect to receive your orders in their entireties in the future. As a courtesy, we have added a company credit to your account. The credit will automatically apply to your next order. If you need further assistance, please don't hesitate to reach out to us. Thank you again for your business. Considering how prevalent distressed wood is these days I was disappointed to find that this is not real wood but MDF wrapped in printed paper. I should have read the details: " upcycled wood fiber with a wood-grain design." Has no surface texture. Hello Timothy. Thank you for your honest feedback. As you mentioned, this beautiful frame is made of 'upcycled wood fibers' as listed in the description. If you would like to return the frame for a full refund, we will be glad to email you a UPS return label. 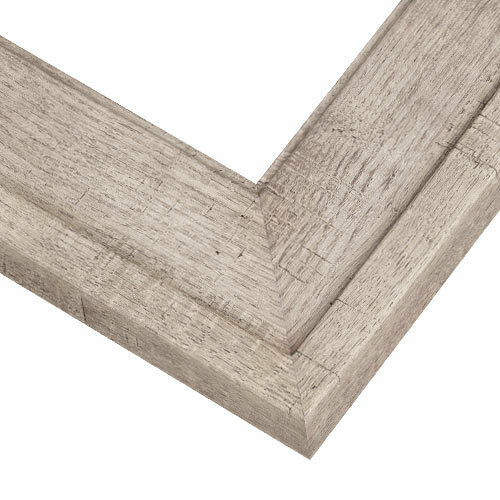 You may want to check out our Barnwood Collection which is made of reclaimed barnwood. We sincerely apologize for any inconvenience this may have presented to you. We look forward to supplying you with more of your framing needs. Thank you again for your business! I think this will coordinate nicely with a coastal theme. Works with the pastel that I did. Price is right. I like the rustic charm of this style, and I appreciate the fine craftsmanship of Graphik Dimension's frames. This frame looks like drift wood. A great frame for ocean art work. Got a few of these awhile back for some medium-sized prints for our home (16"x16" in 24"x24" mats), and ended up selling a couple of the pieces in them, so thought, "welp, better get some more." I really like the tone and think the rustic motif works really well with color inkjet prints made from film of my nature, landscape and travel photography. 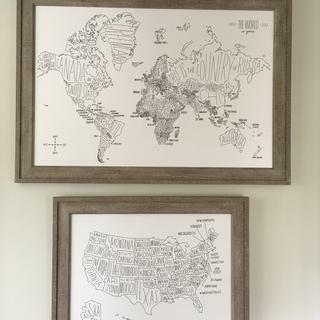 I have been looking for months for a particular size frame. Your website allowed me to customize the frame size to my specifications. It works well for color and style of the art print that I am framing. Giving one of my paintings as a wedding gift and thought it would fit their décor and the art. This frame is for a picture of a sunrise in the Outer Banks of NC with weathered wood stairs and railings in the fore front. There are lots of pinks and blues in the picture and this looks to be perfect to go with those colors. I am going to hang the picture in my beach cottage in the Outer Banks. Compatible with artwork. Nice finish. Great reviews. Will this frame work with a 20x16 canvas with an insert of 5/8"? BEST ANSWER: The frame and framing job of a seascape oil were a gift, and I don't have access to the item at this time. Thus, I can't answer your question. Apologies! I do recall that the frame does stick out a bit, but the frame and canvas look terrific. Yes it will. I have a small one containing a beach scene with beach fence the same color as the frame. It sticks out a little in the back, but still works and looks great. Yes, you can frame a 5/8" canvas however 1/8" will extend out the back of the frame since the frame is 1/2" deep. Will this frame work for a 10x10 canvas that is 1" deep? BEST ANSWER: It will work if you don't mind 1/2 " protruding from the frame in the back. The depth of the insert for the frame is only 1/2 " deep. I purchased it for a 5x12" picture which was sold. So, I don't have a photo of it but as you can see, it was tiny with a huge frame but looked fabulous on a little sailboat regatta painting. So, 10x10" or 10x10' still looks good, just as long as you're ok with it not fitting flush in the back. Hope this helps. As someone else said your canvas will protrude from the back. There are braces that you can get for this purpose and will work fine if you don't mind not being able to put paper on the back. What all do I need to frame a 36x36 canvas that is rolled up? I've never framed anything before Thank you! BEST ANSWER: Your canvas would need to be stretched on stretcher bars first before it could be framed. Our customer care team can walk you through the steps to complete your work. They are available at 1-800-332-8884. Thank you! Could I use this frame to hold a large (18” by 68”) mirror? BEST ANSWER: Hello Kevin. This gorgeous frame has the ability to hold a large mirror, however, we can not confirm an exact weight capacity. The Frame is designed from MDF Wood which is not suggested to be used in a bathroom due to the moisture in the bathroom not being good for long term use. If you need additional assistance, please give us a call at 1-800-332-8884. Happy Framing! Can I get Glass with all your cutom frames? BEST ANSWER: Hello Marianne! We don’t sell glass for frames, we sell picture-frame quality acrylic which is plexiglass. 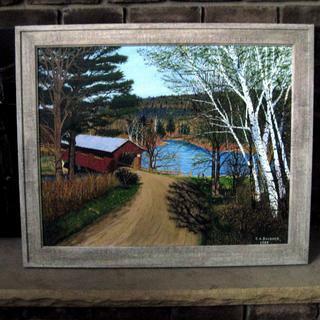 Glazing and backing kits are not included automatically because not all artwork or customers need them for framing. 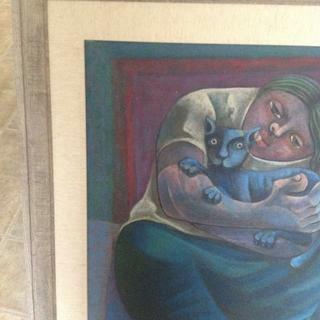 Canvas paintings, for example, would be damaged by glazing of any kind. These are offered as separate add-on items during the ordering process which can be added after a frame size is selected. Thank you for your inquiry! it doesn't say what this frame is made of? BEST ANSWER: Hello! Thank you for reaching out to us. This beautiful frame is wood made from upcycled wood fibers. Upcycled wood fiber frames are made from wood that was rescued from going to the landfill but instead they were made into frames to hold precious memories. If you have any additional questions, please let me know. Have a fantastic day!